There are a lot of Adobe Muse users how would like to create a website in Adobe Muse that give the real ecommerce experience like amazon.com, flipkart.com etc but it was difficult to do as Adobe Muse only work with HTM, CSS, and JS. Ecwid is an amazing e-commence platform that seamlessly integrates with your existing Adobe Muse website. Site visitor will get the convenience of checking out and browsing your products safely right from your site, and yes there is no Ifram or redirection used to show your cart in Muse. Simply drag-in-drop the various widgets to page and start doing you ecommerce business in Adobe Muse. Create a store on http://www.ecwid.com. Add your Producs, payments etc. With the help of our MusePen Ecwid Widget Collection add your store to your Adobe Muse Site. 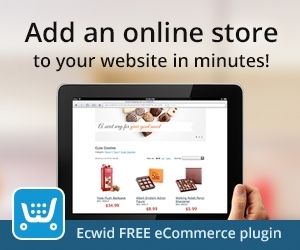 Once you are done Creating your store at ecwid.com then download our widget from the link below. Once you have the Musepen_Ecwid_Collection.mulib downloaded from the link above double click on it to add it to Muse Library. Once Added it will look like this. To use these widgets you just need to drag and drop them in the page and need to customize it as per your need. Now we will explain each widget in the collection and how to use it. To add this to your Page Drag and Drop Product Browser Widget to the Page and open its Options Panel to Customize it. Store ID : Enter your Store ID in this option so that the widget can connect to your store and show the details of your store. Categories Per Row: By selecting this number you can decide how many categories are shown per row. Number of Products in Table Page : Defines number of products on one table page. Default Search View : Defines the default view for search results. Possible values: list, grid, table. This widget allows you to add a search box in your page. When a visitor search any thing in the search box results are shown in the Product Browser Widget. In case product Browser Widget is not placed then results will be shown in a Pop Up window. Lets talk about the MusePen Ecwid Search Box Options Panel. Width : Defines the width of Search Field. Height : Defines the height of Search Field. Border Width : Defines the Border Width of Search Field. Border Color : Defines the color of the Border of Search Field. Background Color : Defines the background color in Search Field. Font Size : Defines the font size of text entered in the Search Field. Font Color : Defines the font color of text entered in the Search Field. Width : Defines the width of Search Box. Height : Defines the Height of Search Box. Border Width : Defines the Border Width of Search Box. Border Color : Defines the Border color of Search Box. Add Image : In case you want to add a custom image for this search box you can use this option to select the image from windows explorer or from Finder. This widget only need to add store Id in the options panel and it will show all the categories of you page horizontally as shown in the screenshot above. This is a responsive widget so it will adjust itself as per the size given by you. You just need to add store Id in the options panel and it will show all the categories of you page vertically as shown in the screenshot above. This is a responsive widget so it will adjust itself as per the size given by you. This widget allows you to add a fixed cart or shopping bag in your page as shown below. You just need to add store Id in the options panel and it will show all the shopping bag or cart as shown in the screenshot above. The moment any visitor add a product to card you will observe that the count in the shopping bag has increased. You can place these items any where in your Adobe Muse Page. This gives you the ability to design your Store page as per your need. Please click on the link below if you wish to download this widget collection.